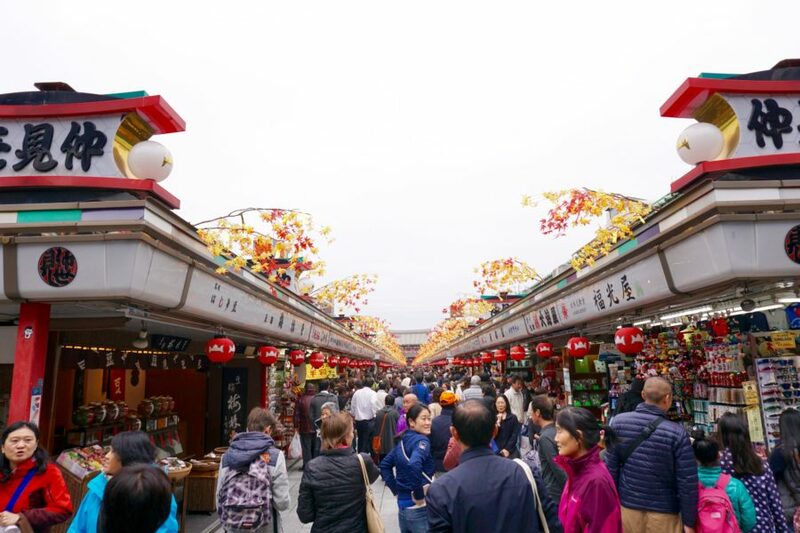 If you are visiting Tokyo on a short trip and need one-stop shopping for Japanese souvenirs, Asakusa market is the place to go. 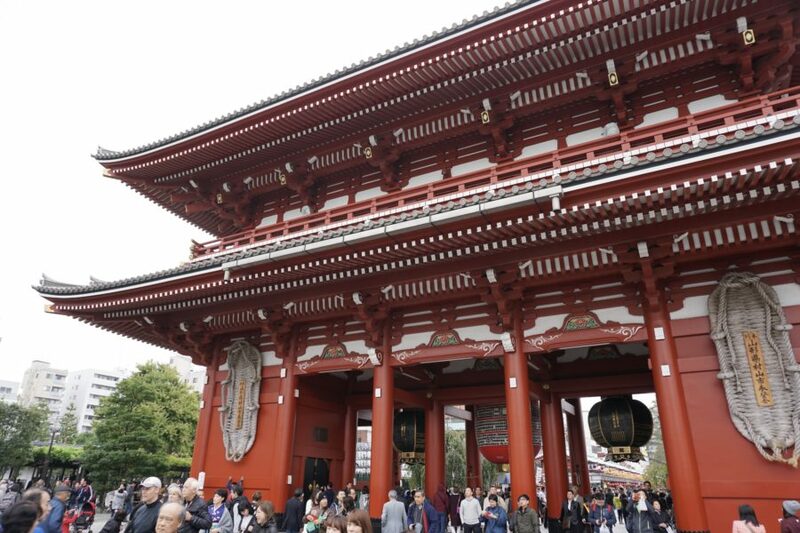 For one, Asakusa is not just a shopping destination– it’s also home to Tokyo’s oldest shrine, Sensoji, which is absolutely worth a visit in its own right. 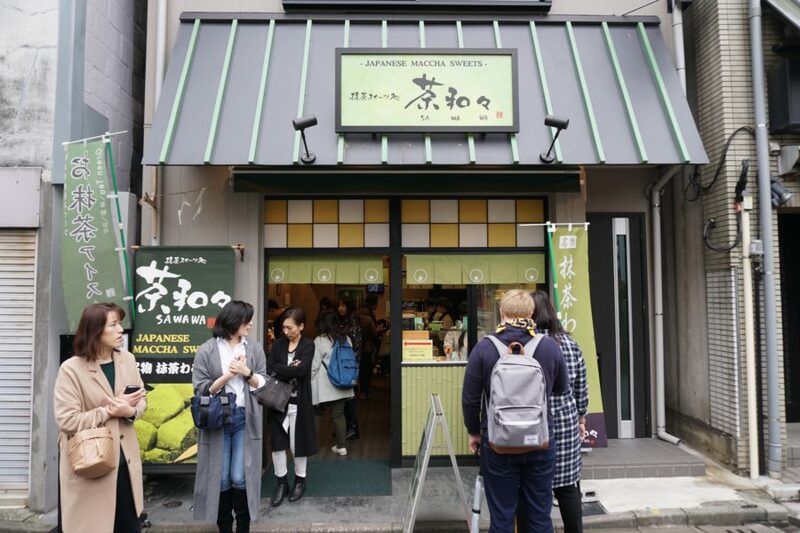 Second, by shopping the centuries old market stalls lining the road to Sensoji, you’ll be following the ancient tradition of shopping your way to the temple. 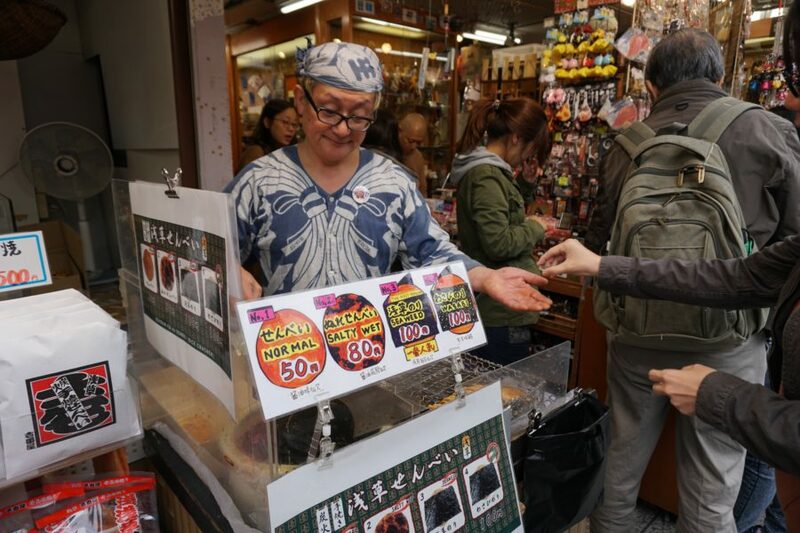 Finally, Asakusa market has such a variety and wide selection of souvenirs, along with delicious snacks, that it is really hard to leave here empty-handed (or hungry). Sensoji temple in Asakusa dates back to the 7th century. 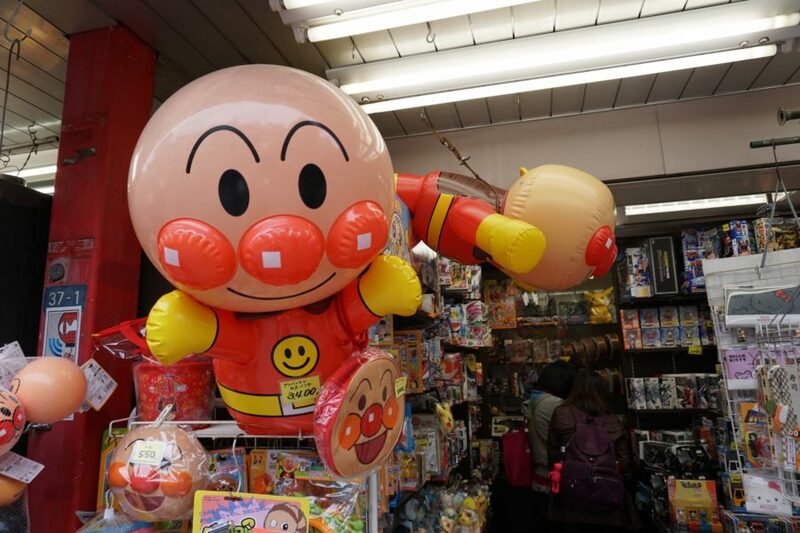 I’ve now visited Asakusa twice on different trips and here is what I recommend– if you love to shop, plan at least half a day here, there are so many interesting stalls not just on the main drag Nakamise street, but also along all the side streets. Also, you’ll want to save a couple hours for the Senssoji temple which is quite beautiful and photogenic. If at all possible, do not visit Asakusa on a weekend, the crowds can be insane (just take a look at my photos from a Sunday, below). Go early on a weekday if you can, the experience will be much more relaxed and enjoyable. 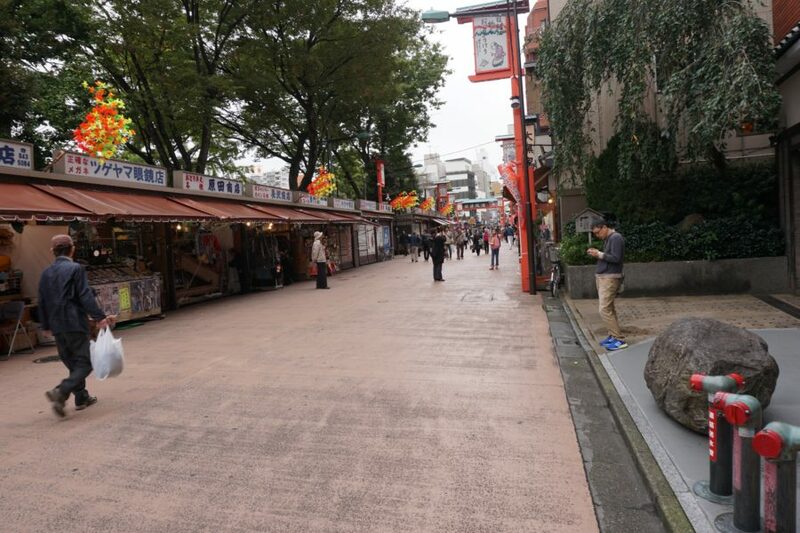 Nakamise street, which leads you directly to the Sensoji shrine, is lined with shopping and food stalls. The best way to explain what Asakusa market is all about is to show you– here is my photo tour of the different types of stalls you can expect to find along the main street leading up to Sensoji shrine, Nakamise. I regret that I did not have time to explore the outlying side streets– a quick walk past a few suggested that the “hidden gem” type shops might lie in these random streets. I am obsessed with these adorable little maneki-neko beckoning cats, promising good fortune to their owners. The raised paw beckons in customers, wealth, and overall good luck. 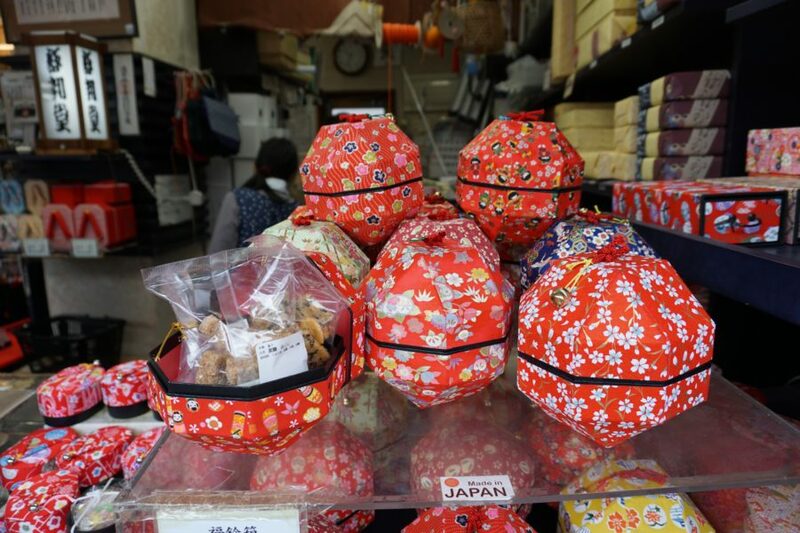 I always pick up several lucky cats for gifts, and I have found that Asakusa market has a great selection. Prices will vary depending on size and quality. Another tip: make sure your lucky cat was actually made in Japan (cheaper cats are likely from China). Japanese Lucky Maneki-Neko Cats are in my mind the perfect souvenir– a little luck, history, culture and adorableness wrapped up in a small (and portable) package. I’ve written extensively about shopping in Japan for a kimono or yukata, check out my post here, or read about my experience dressing up in an authentic kimono here. 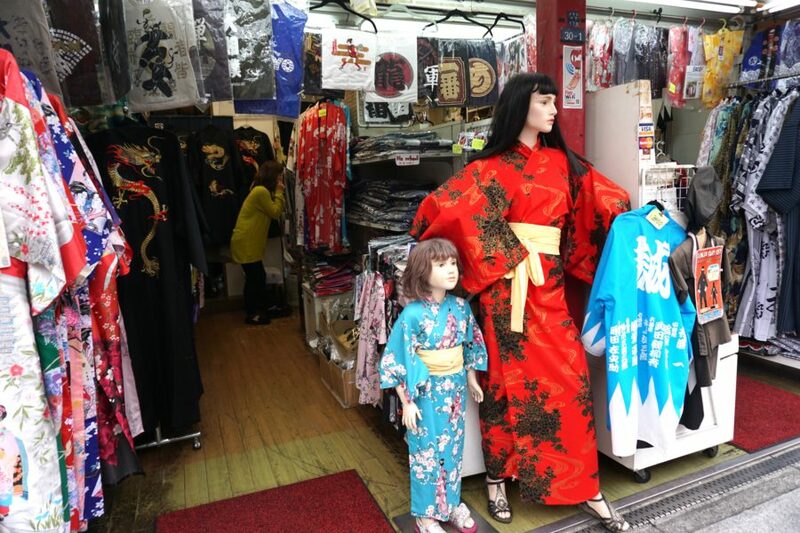 While you won’t find the high quality kimonos costing thousands of dollars at Asakusa market, you can find cheap imitations suitable for a Halloween costume or similar. Yukatas are far more practical than full-fledged kimonos and are great to use as a robe around the house. Children’s versions are pretty adorable too. While tourist kimonos are really only good for playing dress up, yukatas make nice lightweight robes around the house. 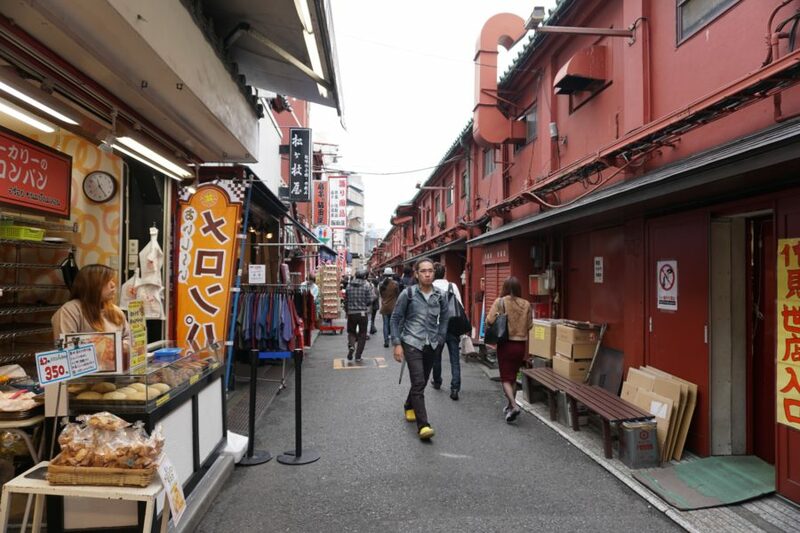 There are many different types of traditional Japanese sandals available at Asakusa market– including those clunky wooden platform sandals that are nearly impossible for we non-natives to walk in. 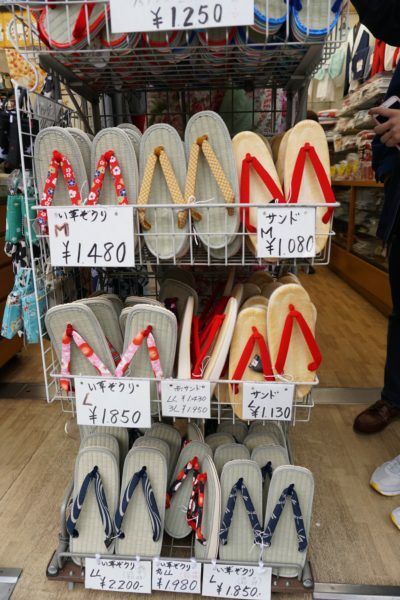 For a more practical Japanese souvenir, look for colorful flat thong sandals– comfortable and wearable back home. A pretty and useful souvenir– Japanese sandals from Asakusa market, Tokyo. I didn’t buy any Japanese fans because I wasn’t quite sure what to do with them back home, but they are lovely to look at. You’ll find gorgeous pricey handmade fans as well as more mass market types at a lower price point. 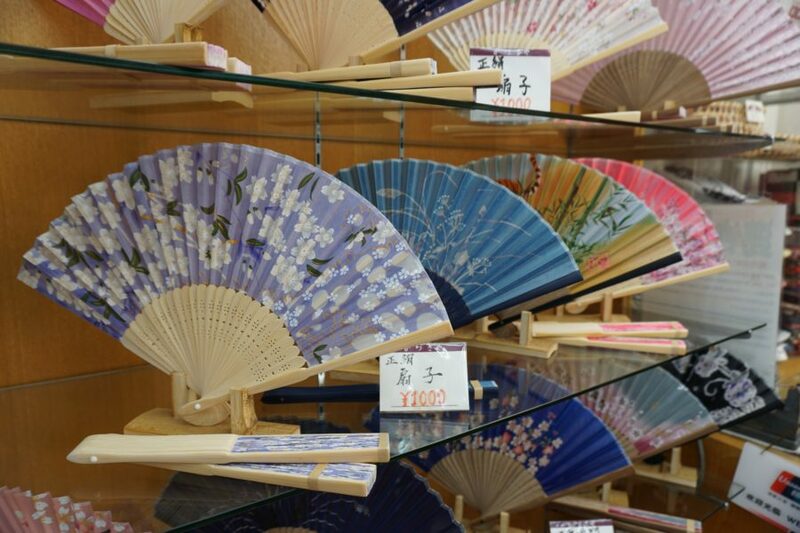 Japanese fans can be used for their intended purpose of keeping cool or can be incorporated into your home decor. 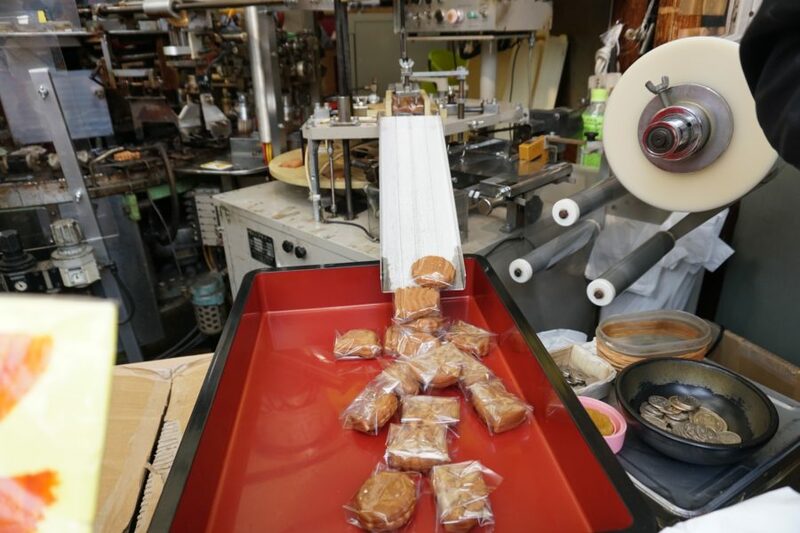 In a tech savvy place like Japan, watching cookies being pressed and spat out of this old school machine is absolutely fascinating. I’m not sure what they are called, but you can’t miss the stall which is close to the beginning of Nakasmise street. If you don’t see the small you will surely smell the wafting scent of freshly made piping hot cookies. Watching the cookies being made is absolutely mezmerizing. 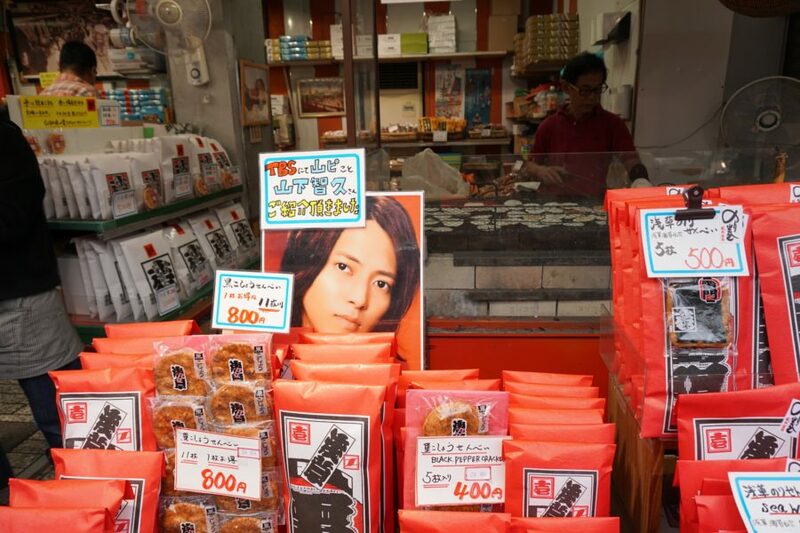 I’m not sure who this Japanese celebrity is endorsing the cookies, but clearly he must be influential. 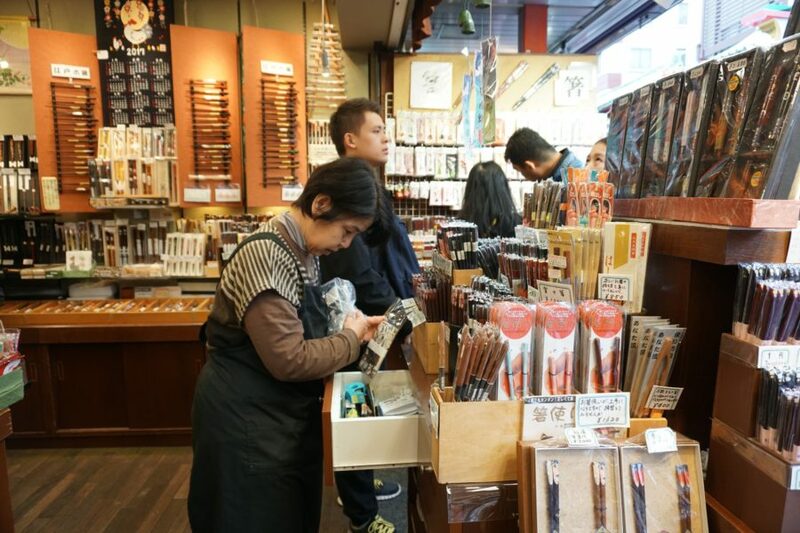 Who knew that entire shops could be dedicated to Japanese chopsticks. Now you know. 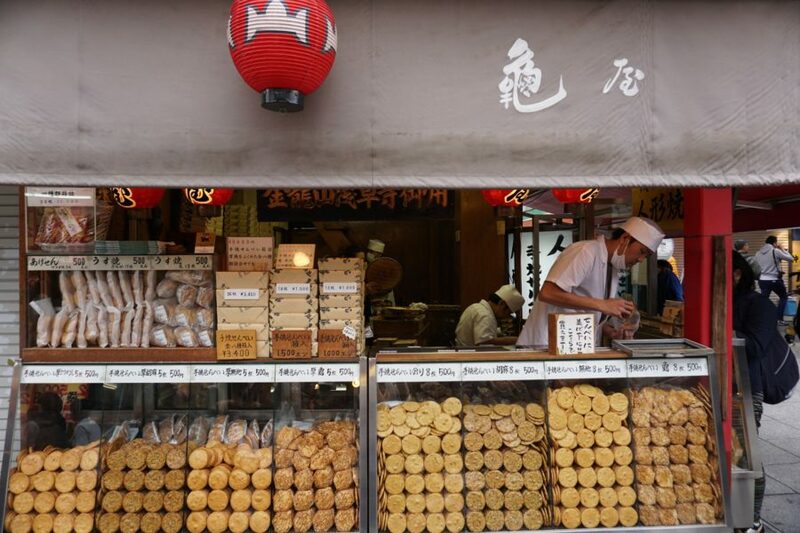 A Japanese chopstick stall at Asakusa market. 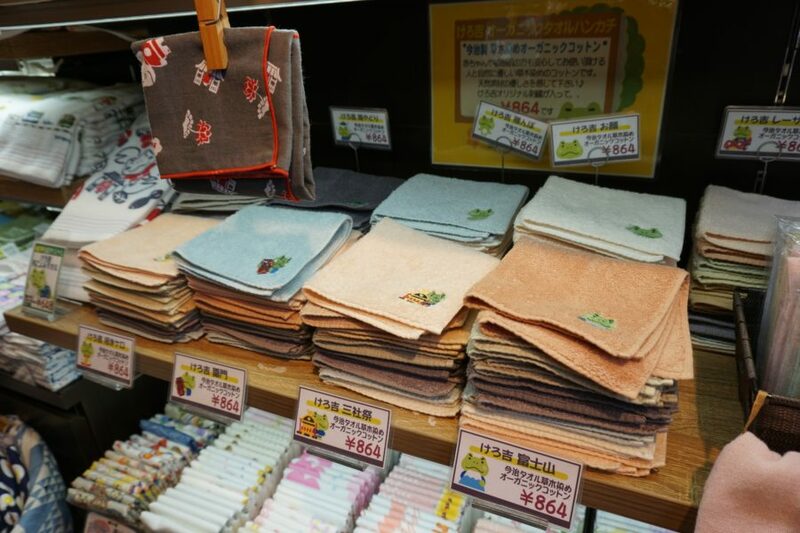 Japan has a large textile industry and is well-known for its absorbent and quirky designed towels. You’ll find small wash cloths and slightly larger towels you can use for a bath. In Japan, kawaii, or “cute” is huge. [Note– pronounce kawaii like Hawaii– NOT like the island of Kauai– because that means dreadful, the opposite of kawaii. I might have learned this the hard way and never lived it down]. Kawaii is so ubiquitous throughout Japan that even the biggest curmudgeon will surely succumb to the cute– I mean how can you not. 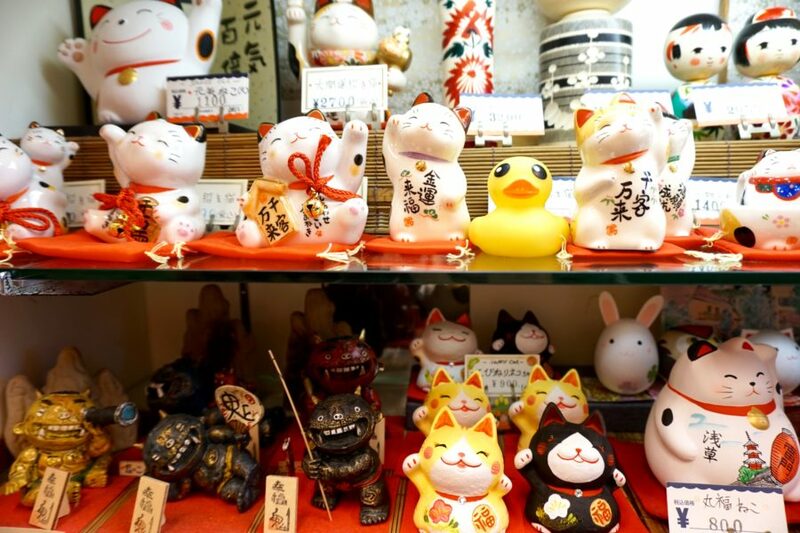 Fortunately, there are plenty of kawaii souvenirs to choose from at Asakusa market. 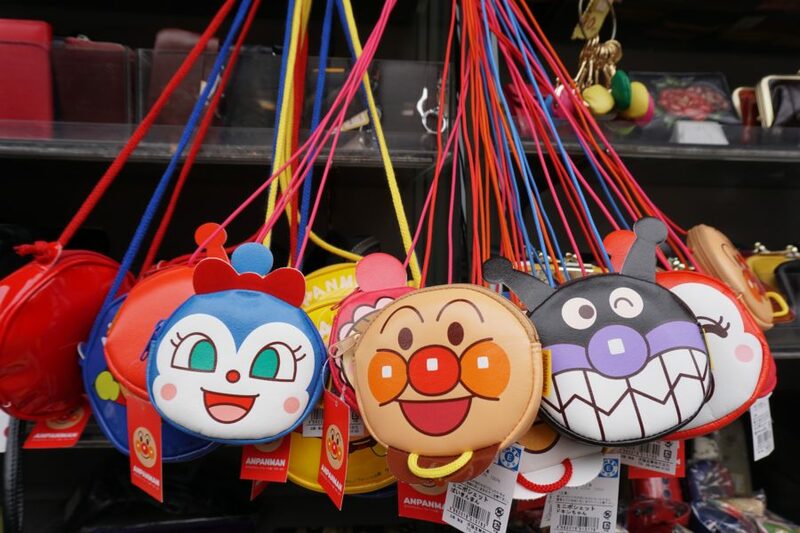 These kawaii handbags are perfect for child– or cute-obsessed adult. Japanese parasols are very traditional, having been used for centuries. They can be intricately made and hand painted or simpler and utilitarian. They can be quite useful for keeping the sun off your face. 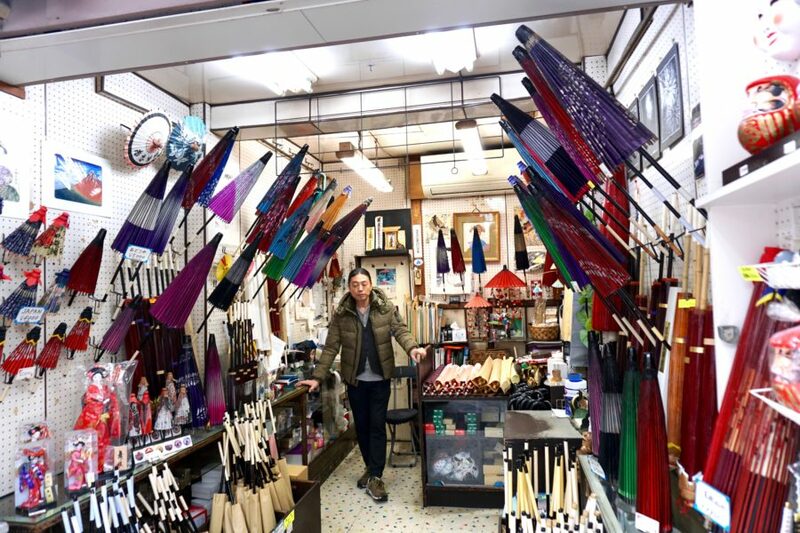 I loved how entire stalls at Asakusa were dedicated to just one product– like these parasols, a traditional Japanese souvenir. What is up with the Japanese matcha crowding my instagram feed? It seems like this trend is everywhere. Why not buy the real thing in Japan– you can buy an authentic kit (complete with whisk) to prep it yourself, or if you’re lazy like me, stick with the instant version (I brought home both the instant matcha tea and the instant sweet matcha latte). 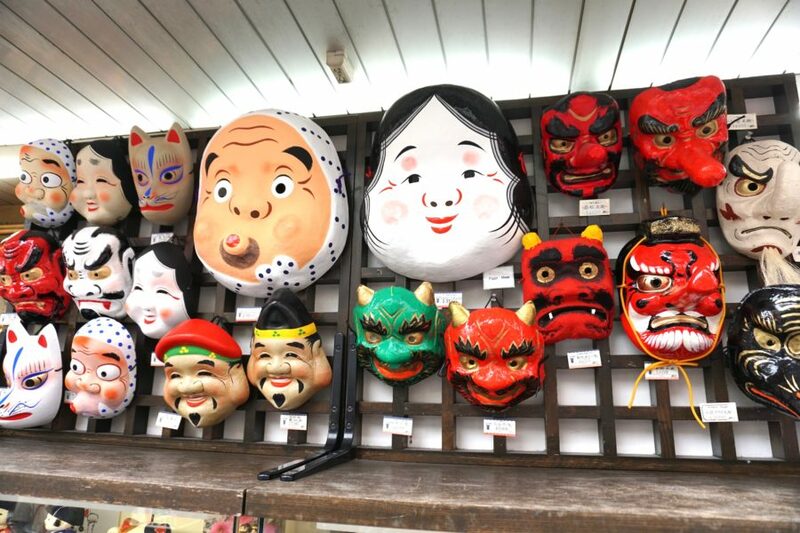 Traditional Japanese masks are used in festivals and theatres but can also make an interesting souvenir. There are several different types and styles of masks if you care to perform further research, or just go with one that calls out to you. To me, masks are like clowns– a little scary and not my thing. I have no idea what sweets were inside, but I was all about these beautiful red boxes. (Asakusa market, Tokyo). We took a fun rickshaw ride around the Asakusa area. It was a great way to get an overview of the neighborhood, and I can now confirm that the entire area is filled with tempting shops. Unfortunately, because I was pressed for time, I was not able to fully explore this outlying area, so I’ll have to report back on my next trip. The streets surrounding Namakise are far less crowded. (Asakusa, Tokyo). If you walk beyond the main street you’ll find even more shops to peruse– you could definitely spend all day just shopping in the area. 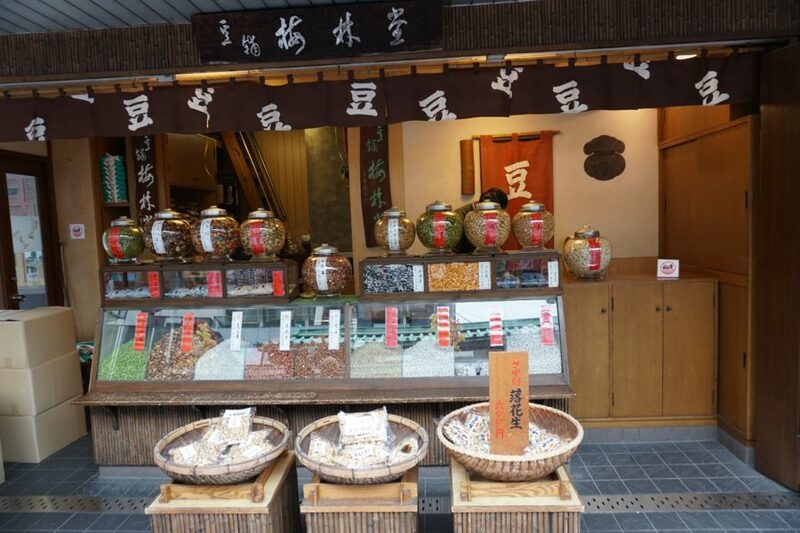 Have you been to Asakusa market? Tell us about your favorite stalls in the comments below! Disclosure: my visit to Japan’s Kanto region was courtesy of JTB. However, all shopping picks are my own. Also, “Kitchen town” is just a few blocks away from there …Blocks and blocks of stores selling kitchen wares. ooh great tip I had no idea!! I ha no idea, awesome tip!! Omg so many reasons to go back!! No, I’ve never been to this place, much less to Japan. 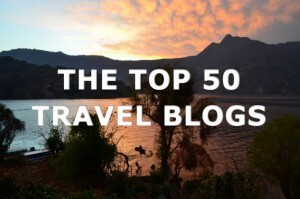 It’s on my bucket list for post-retirement travel. I hope you have lots of room in your house to stash all the things you buy. If I leave from Tokyo on a cruise, I might use the city as my base for a pre-cruise hotel stay. I was wondering if they sell woodblock prints around this area, I’m vsiting Asakusa in two weeks time. Appreciate if where is the best place to buy traditional dolls not the kokeshi dolls. Thanks. Hi Dory! I am unsure of specifics but the area around Asakusa has sooo many shops, many nicer shops than the stalls themselves so I wouldn’t be surprised if there were traditional Japanese crafts like dolls and woodblock prints. Unfortunately I was on a scheduled press trip and only had a couple hours total to shop Asakusa in total which is not nearly enough!! 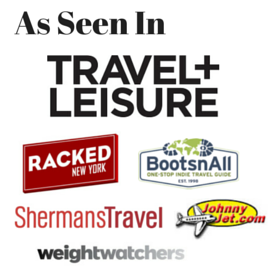 I hope you found what you were looking for and please let us know if you found any great shops.